While there have been some lone geniuses in investing, able to single-handedly choose investments which lead to extraordinary returns, they are few and far between. Real investing edge should instead be cultivated at the organizational level. Properly built, an edge should be very difficult or impossible for others to replicate. Ideally, the edge naturally increases over time—something venture capital investor Keith Rabois calls an “accumulating advantage.” This raises an interesting question that I’ve begun to ask other managers: what important aspect of your firm or investment process would be most difficult to copy? We try to encapsulate this general idea of building edge in our mantra “learn, build, share, repeat,” but specific examples are more powerful. In this letter I discuss two examples of how we are trying to build accumulating advantages at OSAM. First, by adding to our “research graveyard,” and second by building a web of interconnected software-based tools. These are by no means proprietary. My hope is that other firms apply them, too. As always, ideas are easy and execution is hard. Our research graveyard and suite of tools are the result of 32 years of research and 12 years of building at OSAM specifically, with plenty of dead ends and failures along the way. Last year we spent considerable time building a dataset of stock ownership through history. We wanted to know what individuals or institutions owned every stock (and in what portions) on every date through time. We thought that certain type of ownership profiles—say, companies whose founding CEOs owned large stakes and still operated the company—might lead to better returns. We thought that other profiles—say large retail ownership—might lead to worse returns. This data set was a serious challenge to assemble. We devoted a large chunk of our research horsepower to the project, and in the end, we found nothing worth putting into our production model. One of the best ways to evaluate a manager is to ask them about their research graveyard. Of the research projects we’ve pursued over the decades, a significant majority end up like the ownership data project—dead. The quantitative research process is default frustrating. Every good manager will have a large collection of failed studies, each of which takes a lot of time. You have to gather, scrub, and normalize the data (often from many different sources), build signals or factors, and test for predictive power in a variety of ways, both standalone and integrated with factors already in production. It is often shocking—even with the benefit of long experience running these kinds of tests—how much more work each study ends up being than we originally expected. The best way to avoid errors in the future is to have made most of the major types of errors in the past. Said differently, the only way to get good at research is to do a lot of research. Our graveyard, therefore, is one of our greatest assets. Having a large graveyard means that we are well situated to allocate future research attention. Usually, ideas adjacent to other ideas that we’ve tried and buried are best ignored. For example, we’ve tried and failed at making factor timing work many times (in our graveyard, it has its own mausoleum). The next research proposal for factor timing will have to be extremely unique to convince us to allocate firm resources to support it. The headstones of dead projects are well marked. The organization itself has a memory of these projects and our lead researchers have been with us a long time. This memory prevents a lot of waste. Ideas with no real overlap with past dead ideas are more interesting to us and give us a higher probability of finding something useful. You know when you meet another manager who has a big graveyard. They tend to be skeptical, a bit sour, and in awe of factors like momentum. Wes Gray & Jack Vogel at Alpha Architect and Cliff Asness and his team at AQR come to mind. If I were on the other side of the table, allocating capital to quant managers, I’d focus on each manager’s graveyard. The better they can discuss what doesn’t work, or doesn’t matter, the more confidence I’d have in the things they do care about. How intimately do they know failure? This may hint at how badly they want to improve. For the graveyard to be truly valuable, for it to represent an accumulating advantage, it needs to be tracked and shared. Learning from failed ideas is related to our second idea: tool building. A good tool allows the user to do more with less. Our co-CIO Chris Meredith often talks about the fact that his proudest accomplishment is not a research finding which improved our selection model but is instead leading the buildout of our entire research platform. The platform allows other researchers to do more and better work, faster. He leads the construction of a toolkit that provides others with leverage. We’ve realized that a great strategy for OSAM is to build tools—in our case software, data sets, and combinations thereof—but then not direct how they are used. My favorite tool-building story is Amazon Web Services (AWS), which began when Amazon took a set of internal capabilities (things like storage and compute) and turned them into flexible services offered to the outside world. The first time we opened our toolkit to the outside world was for our Research Partners program. We provide our data, programming libraries, and support from our full-time team members in exchange for the research partners’ time and ideas. The program has seven active members, including four PhDs, with more to come soon. The work they’ve done using these tools has led to some of the most interesting research insights we’ve had in years. Our current research agenda is directly influenced by those findings. Tools also lead to other tools (another compounding advantage). Kevin Zatloukal built us software for automating machine learning tasks. You can see and use a version of that here. These things—software, data, research partners, our graveyard, even the podcast and our twitter activity—all link into and depend on each other, which makes each more valuable and harder to copy. Think back to the ownership data project. Without other connected tools, that would have just been a dead idea--time wasted. But now the ownership data set has become a critical piece of another software tool we use for clients called Portfolio X-Ray. It is now also a new data set available to research partners, who may find something interesting that we did not. Next quarter we will be announcing another larger tool to further accelerate our learning loop. Do not override the model. Using this list to describe OSAM’s core factor model is like describing the iPhone as a rectangular touch screen with apps. Both the first and the tenth iPhone models fit that description, but no one uses the first iPhone anymore. Quant models are similar. The basics are laid out in the list above, but every aspect should improve over time. I wrote in my fourth quarter letter about how hard it is to live with underperformance and some of that has continued into the first quarter of this year, mostly during March. 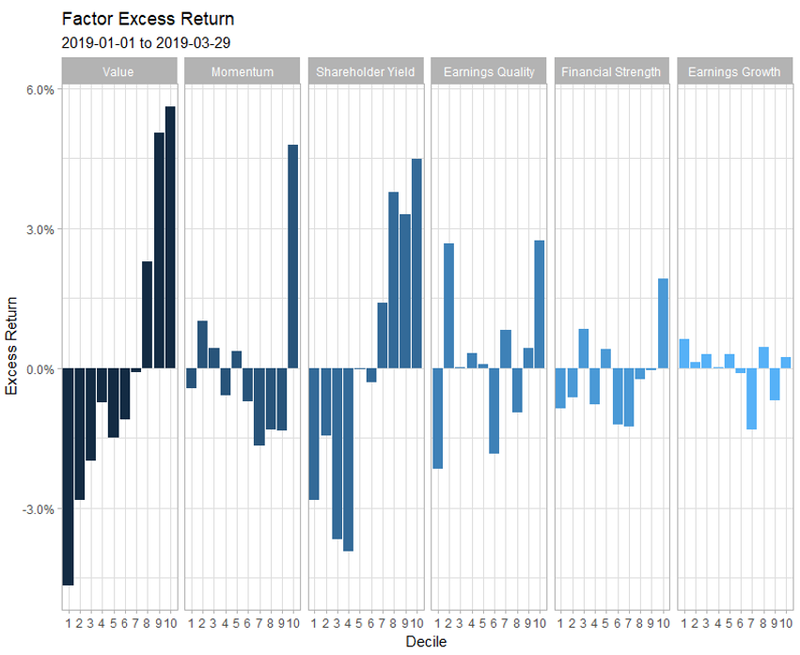 The chart below shows the excess return of each decile of our factor themes versus large capitalization stocks in the U.S. For each graph, decile 1 is the most favorable by the factor. So, decile 1 for Value are cheap stocks while decile 10 are expensive ones. Note that in each of the six factor themes, the least favorable decile 10 outperformed the large cap universe, and in all cases but Earnings Growth, the most favorable decile. In other words, it was a uniformly bad quarter—nothing worked. If it wasn’t for our years of continually testing, questioning, and improving these concepts, they might be easy to abandon after bad short-term performance like this. As quants, we will obviously succeed or fail with our models. Models, even those based on the same factors through time, need tending. But any quant model is the result of what is happening upstream in the business and on the research team. We like to think we have our share of geniuses (Jim O’Shaughnessy and I are surely the least talented researchers on the team), but also believe that edge lives in an organization, not just in people. Hopefully, the examples in this letter illustrate how we try to cultivate an advantage for our investors, and structure the business so that the advantages naturally increase over time. In our business, we sense a blurring of lines between firms trying to grow the overall pie of investor understanding and knowledge rather than trying to find secrets and hoard them. I believe this is the foundation of an enduring asset management business in today’s world. We will keep testing, building, and sharing what we find. The material contained herein is intended as a general market commentary. Opinions expressed herein are solely those of O’Shaughnessy Asset Management, LLC and may differ from those of your broker or investment firm. Please remember that past performance may not be indicative of future results. Different types of investments involve varying degrees of risk, and there can be no assurance that the future performance of any specific investment, investment strategy, or product (including the investments and/or investment strategies recommended or undertaken by O’Shaughnessy Asset Management, LLC), or any non-investment related content, made reference to directly or indirectly in this piece will be profitable, equal any corresponding indicated historical performance level(s), be suitable for your portfolio or individual situation, or prove successful. Due to various factors, including changing market conditions and/or applicable laws, the content may no longer be reflective of current opinions or positions. Moreover, you should not assume that any discussion or information contained in this piece serves as the receipt of, or as a substitute for, personalized investment advice from O’Shaughnessy Asset Management, LLC. Any individual account performance information reflects the reinvestment of dividends (to the extent applicable), and is net of applicable transaction fees, O’Shaughnessy Asset Management, LLC’s investment management fee (if debited directly from the account), and any other related account expenses. Account information has been compiled solely by O’Shaughnessy Asset Management, LLC, has not been independently verified, and does not reflect the impact of taxes on non-qualified accounts. In preparing this report, O’Shaughnessy Asset Management, LLC has relied upon information provided by the account custodian. Please defer to formal tax documents received from the account custodian for cost basis and tax reporting purposes. Please remember to contact O’Shaughnessy Asset Management, LLC, in writing, if there are any changes in your personal/financial situation or investment objectives for the purpose of reviewing/evaluating/revising our previous recommendations and/or services, or if you want to impose, add, or modify any reasonable restrictions to our investment advisory services. Please Note: Unless you advise, in writing, to the contrary, we will assume that there are no restrictions on our services, other than to manage the account in accordance with your designated investment objective. Please Also Note: Please compare this statement with account statements received from the account custodian. The account custodian does not verify the accuracy of the advisory fee calculation. Please advise us if you have not been receiving monthly statements from the account custodian. Historical performance results for investment indices and/or categories have been provided for general comparison purposes only, and generally do not reflect the deduction of transaction and/or custodial charges, the deduction of an investment management fee, nor the impact of taxes, the incurrence of which would have the effect of decreasing historical performance results. It should not be assumed that your account holdings correspond directly to any comparative indices. To the extent that a reader has any questions regarding the applicability of any specific issue discussed above to his/her individual situation, he/she is encouraged to consult with the professional advisor of his/her choosing. O’Shaughnessy Asset Management, LLC is neither a law firm nor a certified public accounting firm and no portion of the newsletter content should be construed as legal or accounting advice. A copy of the O’Shaughnessy Asset Management, LLC’s current written disclosure statement discussing our advisory services and fees is available upon request. Hypothetical performance results shown on the preceding pages are backtested and do not represent the performance of any account managed by OSAM, but were achieved by means of the retroactive application of each of the previously referenced models, certain aspects of which may have been designed with the benefit of hindsight. ▪ Although OSAM may consider from time to time one or more of the factors noted herein in managing any account, it may not consider all or any of such factors. OSAM may (and will) from time to time consider factors in addition to those noted herein in managing any account. ▪ OSAM may rebalance an account more frequently or less frequently than annually and at times other than presented herein. ▪ OSAM may from time to time manage an account by using non-quantitative, subjective investment management methodologies in conjunction with the application of factors. ▪ The hypothetical backtested performance results assume full investment, whereas an account managed by OSAM may have a positive cash position upon rebalance. Had the hypothetical backtested performance results included a positive cash position, the results would have been different and generally would have been lower. ▪ The hypothetical backtested performance results for each factor do not reflect any transaction costs of buying and selling securities, investment management fees (including without limitation management fees and performance fees), custody and other costs, or taxes – all of which would be incurred by an investor in any account managed by OSAM. If such costs and fees were reflected, the hypothetical backtested performance results would be lower. ▪ The hypothetical performance does not reflect the reinvestment of dividends and distributions therefrom, interest, capital gains and withholding taxes. ▪ Accounts managed by OSAM are subject to additions and redemptions of assets under management, which may positively or negatively affect performance depending generally upon the timing of such events in relation to the market’s direction. ▪ Simulated returns may be dependent on the market and economic conditions that existed during the period. Future market or economic conditions can adversely affect the returns.